History: This is the 9th year for the event. In 2018, Inbee Park carded a bogey-free 5-under, 67 to claim her 19th LPGA Tour victory on Sunday. She finished the week at 19-under, five shots clear of second. Oy. 'Finally managed to get logged in to the new site. 'Still not working right with all browsers. Anyway, the tour is back in the U.S. at the annual Spring birdiefest. Four of the last six tournaments have been won with scores below 20 under, with two below 25 under. The weather looks gorgeous for the next four days, so scoring should be low. My pick this week is Nelly. She's currently leading the tour in birdies, and this course requires them in bunches. Ariya and Sei Young should also challenge for the win. Creamer withdrew, no reason given. Great stuff starting a thread Argonne, I don't particularly like this course (bit of a goat track that turns into a putting competition) but it honors the founders, so I gotta cheer for it. Next week it's one of my favorite course on the LPGA schedule, how much I enjoy the Kia is dependent on how lush the rough ends up being (love punishing bad drives) lol. I got no real picks this week, Nelly and Minjee should be up there with their current form and I also think Sei Young Kim is worth a look she does very well on these courses without much danger on the drive or approach shots and that tend to give up low scores. Right now this has nothing to do with change; this new site is, often like my scorecard, an eye sore... I really hope it doesn't stay like this, it looks terrible. Woot, IK's finally starting! Last season started with the stolen clubs crime caper, and ended with the back injury, so wasn't a great fair shake. Did have the great IC though. Hoping this year is clear skies, see what happens! Hee Young and MJ are starting too! After last season, I wasn't sure if MJ was still up for it. New year, new possibilities. I'll be cheering for them, super excited. Actually this one has more players for me on the "my leaderboard" thing than in a long time. Like how many players do you all have on? Ahh ... I hate to be a naysayer, and I have no doubt a lot of work went into the new forum. But, I did like the old one better. Hope this one develops a bit more and gets to look a little more like it used to. It`s easy to go with the obvious choices week in and week out Ariya, Minjee, Lydia..etc. 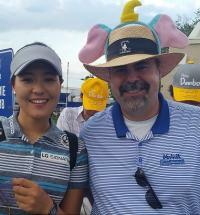 I don`t know if she can go low enough, but I`m liking Megan Khang this weekend. With 2 top 5`s in the last 3 years, why not? I like the nods for Sei Young as well. Maybe Anna Nordqvist can get something going here, she`s won before. Anne Van Dam or Amy Yang hanging around maybe? Glad to see the tour back in the States finally, let the fun begin! Not glad to see this new forum, so far. I'm glad to see Hee Young Park playing as well. Unfortunately, the end is probably near for both of these ladies (MJ Hur's game really declined last year after getting married). Na Yeon Choi also playing this week. No idea how her game is right now. The swing was always go good - unfortunately her game was derailed by injuries. Lurking around this site for a while. Finally got the courage to make a few posts over this last weekend and then this big change.LPGA was my favorite read by far for a long time until I kinda lost interest over the controversial happenstance at the ANA a couple or 3 years ago. I have a few comments/questions for some of the sages on this thread. Icher and Piller in the same group both returning after giving birth to their 2nd and 1st child respectively. Was surprised some of the Piller fans made no mention of her performance in her 1st tournament back over in the far east earlier this month.Wise on her account to choose a no cut for her return as her "game"over there smelled like soiled baby diaper. Does anyone on here know if the female caddie that Gerina used to employee was the same caddie that was on Kim Kaufman's bag at the the tournament in Australia earlier this year where she had the 54 hole lead?To me there was a strong resemblance.Anyway I predict Icher to be a trunk slammer Friday afternoon and Piller to bounce back to better form and make the cut. How is Cheyenne Woods related to Tiger?I almost couldn't believe she shot -7 at the Monday qualifier and still didn't get in the field. 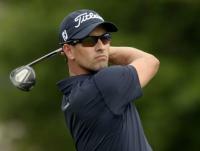 Monday qualifiers are tough One must go for broke and try to birdie every hole. 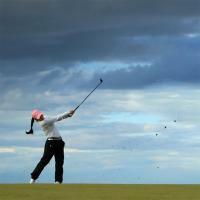 Thanks Argonne for all you contribute to this LPGA forum.I'm guessing she's the daughter of an older brother of Tiger. A few years ago there was a man on this forum that lived in New Mexico and attended this tournament.Anyone know what happened to him.Also anyone know what happened to Mr22putt? The return of Na Yeon Choi is a very big deal. To this golf fan at least. Quite the start today! I'm a huge fan of NYC. Someone posted earlier about the competitive Monday qualifier, which had me curious. I don't mean to crush dreams or come off as rude, but who is helping some of these ladies. I see popular names from Instagram, cactus tour, golf channel shows...Ostrom, Christianson, Sagee, Henderson and Walshe. These women usually struggle to break 75 yet alone 70. I am sure it's fun to tell people your a pro at something, but doesn't it get embarrassing to pretend? Shanshan didn't work on her fitness in the offseason. She looks like she could tip over at any moment. I guess these golfers whether they be women or men believe that they are just one super low round away from grasping a hold of and keeping something they are really not capable of.I guess it would be hard to fess up to the truth when you have been told for most of your life by a lot of well meaning family and friends how good you are.I think too on the ladies side they are enabled as well by the huge performance gap that can occur from one day to the next among the mid lower tier to lower tier players.The LET has an infestation of these type players and the aforementioned gap.A fairly prolific player on that tour(I believe a past winner)at a tournament in Australia earlier this year made the cut and finished with a score of +26.Then with no week off to tune up her game or take a mental pause she finishes top 10 the next 3 tournaments.I guess for these players at the Monday qualifiers the dream stays alive until you and/or your family and sponsors run out of money$$. You're probably referring to tesuquegolfer. He was a regular at the Phoenix tournaments, and a big fan of Belen. I see that he hasn't been active on the site since December. 'Hope everything is OK.
Nice opening round by angel Yin, but her problem is putting 4 rounds together. Then again this is the graet type of course for a player like Angel to get her first win. Na Yeon with an opening 65 'Hope her injuries are finally in the past. On that note it looks like Charley Hull dropped a few pounds, or is it me? I'll be there tomorrow. Wife and I go every year as we were members at Moon Valley when it hosted the event. But up at the top I have to cheer for Porna, any opportunity she can get. Though you usually can't make much of the first round. Yeah, last year was a super rough season for MJ. I'm just really happy to see her back playing. Like you say, maybe is near don't know how I'll handle my favorites leaving. I'll never like anyone as much as this wave of players. Well, long as they have something great and happy to go on to. I noticed the same thing. I wonder if she has lost any distance? Yeah, great round for NYC. Her, So Yeon Ryu, and HYP were the three I started watching the most when picking up the game again several years ago. I guess I alos like Ingee Chun too (a bit younger/more recent). Never a big fan of Inbee or SHP, even though Inbee has the best record and SHP will probably finish with the best among the current crop of Koreans (don't think Ryu has time on her side to match SHP. Ingee theoretically could if she gets her game back where it was). Yes it was tesquegolfer.I hope everything thing is okay as well. Celine has been having a heck of a season so far. It's interesting when a player that previously was a non factor jumps into the mix on a regular basis Makes you wonder what changes were made off season . On Morning Drive they said Celine really struggled with the mental side. They were saying it started her senior year at Duke, so by the sounds of it. it was sports psychologist that helped and was probably many years involved in the process.